Over the past nine months or so that I have served as NACo president, I have urged local governments to focus on bringing critical services to citizens in need. And over the past year, I’ve witnessed some of the best in class examples of county innovation and local government at its finest. “Connecting the Unconnected” highlights three key areas of focus and I’m delighted to provide three examples of how California counties and local governments are providing leadership and innovation in these areas. 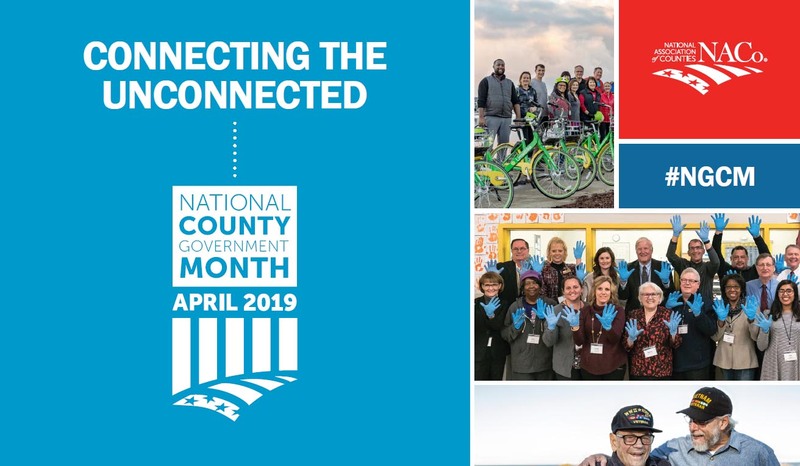 Technology is the first area of focus for “Connecting the Unconnected.” NACo is showcasing best-in-class technology that helps counties deliver critical services. This includes 211 and other centralized resource centers: Telemedicine, broadband and public transportation technologies. Utilizing the latest technology to provide an “omni channel” service that includes a free call line, searchable online database, text, chat and social media, 211 in San Diego County connects the unconnected to more than 6,000 community, health and disaster support services, 24 hours a day. Enrollment services: Partnering with the California Department of Social Services and the County of San Diego, 211 San Diego’s Enrollment Center helps people enroll in CalFresh and Covered California over the telephone, saving time and resources and eliminating barriers to in-person enrollment. Military and veteran services “Courage to Call:” In partnership with the County of San Diego and several local nonprofit organizations, funded in part by Mental Health Services Act dollars, 211 operates San Diego’s peer-to-peer talk and chat line serving as the single access point for information, referrals, navigation, and ongoing care coordination for active duty military, veterans and their families. Learn more about San Diego’s 211 program here. Technology is just one way to reach and improve the delivery of services to citizens. Data is the second focus of “Connecting the Unconnected.” NACo is demonstrating the importance of data-driven decision-making in improving resource allocation. Data is being used to create targeted delivery models for core county services like mental health programs, substance abuse treatment, justice reform, housing, transportation and veterans’ resources. In Nevada County, a series of suicides among teens and young adults brought the need for early suicide prevention to the forefront. Nevada County held community brainstorming sessions to gather information and identified a Suicide Prevention Task Force to analyze community mental health perception, access data and come up with solutions. While programs existed to serve high school students identified as high risk, there was a need for comprehensive screening programs for youth in a county with a history of resistance to “outside intervention” and low access to mental health services. The Task Force chose Columbia TeenScreen as an evidence-based screening program and integrated it into school-based What’s Up Wellness Checkups (WUWC) to normalize mental health screening like any other checkup, a standard part of maintaining overall health. Based on data from the initial round of screenings, a significant number of students faced mild-to-moderate anxiety or depression and families struggled with barriers to treatment outside of school. Nevada County used WUWC to begin providing in-school prevention groups and case management services for students. Responding to data that 10th graders have the highest suicide completion rate among youth, the WUWC screenings were designed to target incoming 9th grade students during school enrollment. This unique utilization of data and adaptive programing helps destigmatize mental health services and connects hundreds of students with mental health and case management services, potentially keeping youth out of juvenile hall, hospitals and other intensive mental health services. Read more about this program here. The third focus for “Connecting the Unconnected” is Financing. NACo is illustrating the importance of public-private partnerships to ensure sustainable funding and coordination of services. This includes partnerships with neighboring jurisdictions, community-based organizations and other public and private sector partners to provide long-term resources to support county programs. When Contra Costa County’s Employment and Human Services Department (EHSD) determined it needed more data to effectively manage its programs, it looked to a neighboring county for a cost-effective solution. Santa Clara’s Social Services Agency had invested over $2 million in a Business Intelligence Solution with a robust database, dashboards and drill down reports. After conducting a multi-step review of the project including a feasibility study and MOU, Contra Costa EHSD was able to integrate its data with Santa Clara’s existing database, run its own reports and deliver improved productivity and better compliance. Through the partnership, Santa Clara achieved an overall cost reduction for its business intelligence solution and Contra Costa achieved its goals in a shorter timeline and for significantly less money than if it had contracted a solution on its own. Learn more about this cost-saving partnership here. As these examples illustrate, “Connecting the Unconnected” is designed for counties of all shapes and sizes. There is no cookie-cutter approach to connecting residents; what works in one county may not work in another. But we share similar challenges and can learn from one another’s experiences to be an immense force for the public good. NACo President; Supervisor, San Diego County, Calif.
San Diego County, Calif. Supervisor Greg Cox was elected NACo President on July 16, 2018. He has been active in NACo since 2002, serving on the association’s board of directors as well as on the Large Urban County Caucus and task forces. How can counties best connect the unconnected?